“KARTHIK PUNNAV” was celebrated at our Balaji Mandir Vasai Road, program began with Bhajan at 7 PM and ended at 8:30 PM, during the course of Maharati, all the lights were put off and witnessed “Vishwaroop Darshan” it was amazing to see Lord Sri. 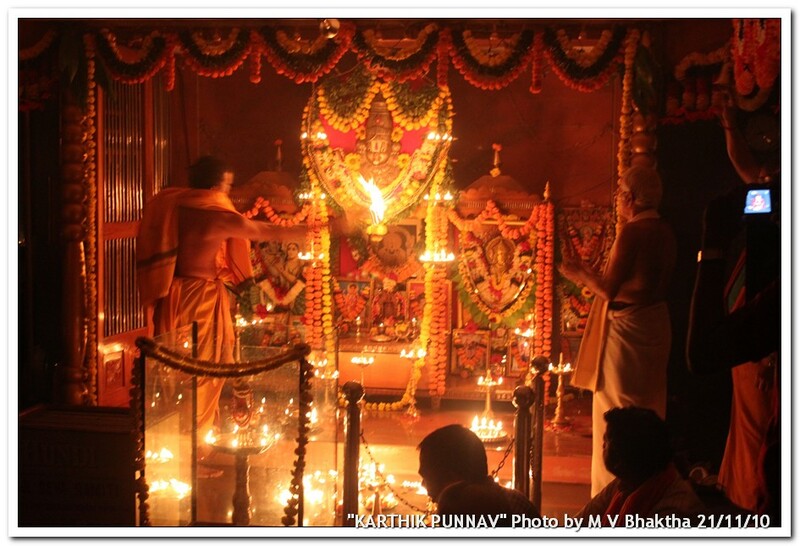 Balaji under natural lights of “Divvo’s” “Divvli’s” & “Lamman Divvo” it was like real “Deepotsav” held in Karkala or Bantwal but a smaller version. After the Maharati was “Bhoori Samaradhane” with “KadgeAdgai” “Batata Vaagu” “Tendle Batata Upkari” “Daalithoy” “Pappodu” “Chana Madgaane”, a Seva by Sri. Hosmata.Manohar Shenoy and Sri. Manjeshwar Vivekanand Bhaktha, it is a “Shashwath Seva” from both of their families.